Gold, the sun metal, and carbon, the substance of organic life on earth, occupy a central position in this study of the mineral system. 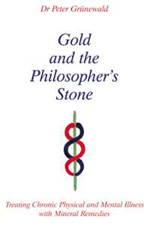 The Philosopher's Stone is achieved through the 'transformation of carbon' and the 'creation of gold'. The author shows how the important medicine Aurum (made from gold) relates to this process. He suggests that a mineral therapy centred on the principle of transformation conceals future spiritual mysteries which relate to evolutionary laws inherent in the physical and higher bodies. DR PETER GRUNEWALD was born in Germany in 1959, and completed his university training as a medical doctor in Austria in 1986. He works as a general practitioner within the NHS and in private practice in Bristol, and also as a medical adviser for people with learning difficulties and mental health problems. He has been studying and practising anthroposophical medicine, a complementary medical and holistic approach, alongside mainstream medicine for more than 16 years. His particular interest is research into the therapeutic aspects of substances and their application in the treatment of chronic mental and physical illness.